Look. Information properly layered and easy to digest. 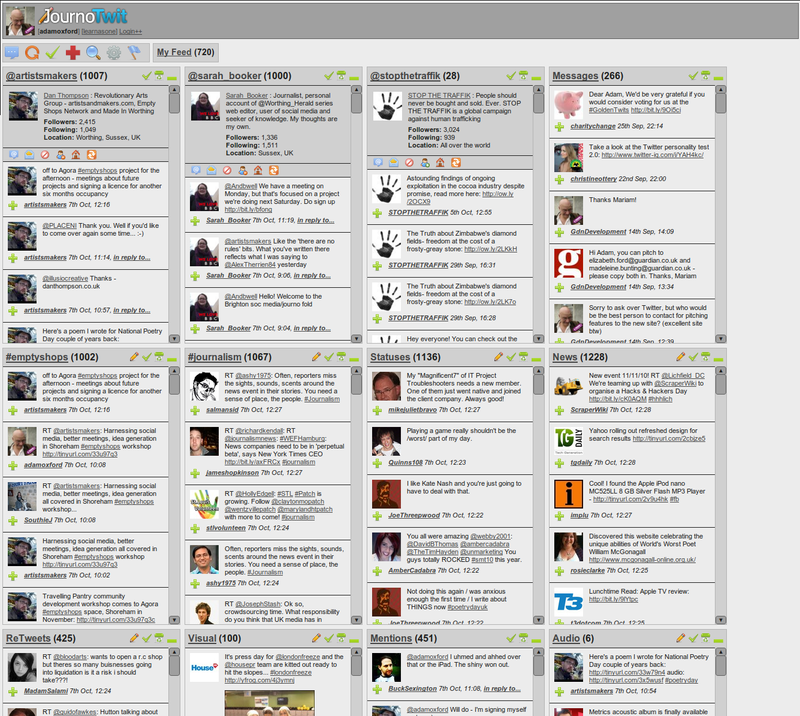 Perhaps it’s because it was the first Twitter client I ever properly used, or perhaps it’s because it was coded by a friend, but I find Journotwit an indispensable (and free) tool for researching stories or staying on top of Twitter. It has two key advantages over anything else I know of, including the better known Tweetdeck, Seesmic et al. Firstly, it’s entirely browser based. Whatever machine you log in from, just open Firefox, Safari, Opera or Explorer and your Journotwit desktop will be exactly the same as you left it, with the same columns displayed, the same searches or pand you don’t have to download anything. 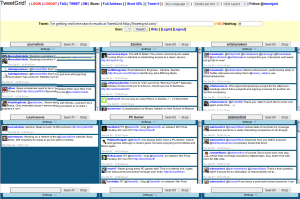 The main reason I use it, though, is because it’s the only Twitter client I know that supports a grid-based layout for columns, arranging them both horizontally and vertically. 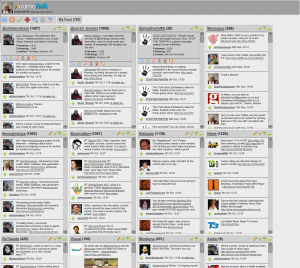 To see the same number of feeds in a Tweetdeck screen as I can see on Journotwit would involve stretching it out across the bottom of two monitors. It’s such a simple but effective design tweak, I’m amazed so few other clients do it (Tweetgrid, obviously given its name, is the only other one I’m aware of). It’s a far more effective way of breaking Twitter down into manageable chunks. 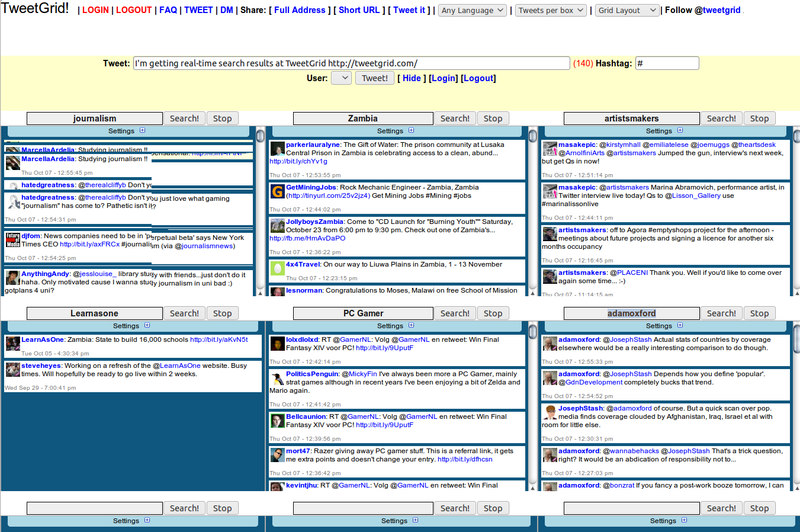 Tweetgrid does something similar, but opens names and searches in a new window, rather than a new column. Journotwit is also really fast these days. New columns and searches are added with a single mouse click on a name or hashtag, and it intelligently splits status updates into two different branches – one for comments and one for anything that contains a link (ie. potential news). You can’t use Journotwit to monitor Facebook or LinkedIn, but I don’t really use either of those to monitor trends and quickly run realtime searches anyway. As much as I rely on Journotwit, there are two other Twitter tools I find essential. First off, there’s no build in desktop notification in Journotwit (although there is a sound when a new @ mention or message is displayed), so Ubuntu’s built in Gwibber client is handy for quick views of direct messages. Secondly, the mobile version doesn’t really work at all for me: the scrolling between columns or content are both done vertically, so it’s a bit visually confusing. Out and about I prefer Tweetdeck’s iPhone app – if only there was a way of synching columns between that and desktop Journotwit, I would be in Twitter heaven. You can follow me at @adamoxford, by the way.